Last Friday the Middleton Council on Aging/Conservation Commission (COA/CC) hikers visited three sites where falling water once turned wheels that sawed logs, ground grain, and helped make iron. In their two-mile loop on Mill, Liberty and Peabody streets, the passersby saw reminders of sites once important to area farmers. The large iron works dam below Mill Pond just off Mill Street is leaky but still intact. It is owned by a man in Arizona who hasn’t paid taxes for several years. If the town takes it over it becomes responsible for the dam. Last year the Middleton Historical Commission placed a three-ton stone with bronze sign near the sluiceway where for three-quarters century in colonial times the great water wheel turned and trip hammered molten metal from local bog iron ore. The famous Saugus Ironworks just 15-miles south, now a national park, only did so for a quarter-century as some Middletonites like to point out. 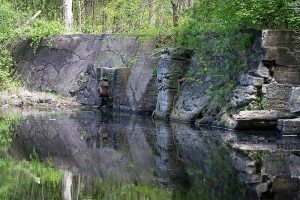 Two more mill sites passed last week by the seventeen old timers were ruins of the Peabody-Averill sawmill on Boston Brook on Mill Street just north of Peabody Street and the Nichol’s grist mill ruins on Emerson Brook just west of Liberty Street. The Nichols mill on the same brook as the Iron Works competed with it for water. Six other water run mill dam ruins in town not visited by the hikers that day were a sawmill on Boston Brook near North Liberty Street, a sawmill below Creighton’s Pond off Essex Street, a sawmill east of Mount Vernon Street on Middleton Brook, a grist/sawmill near the center of town on Middleton Brook, another two, one a grist/sawmill and another sawmill up Emerson Book that ran on water down from Reading and Andover, and those on the Ipswich River in south Middleton at Bostik where wool was cleaned, logs sawn, paper made from cloth rags, and shoe industry chemicals produced. The old mill sites are visited by COA/CC walkers every year or so. Hikers are reminded of a time when wool, paper, timber, flour and iron were very expensive. Now within a 15-minute drive many places that sell these goods at low prices can be found. All our school children should be required to visit these mill ruins on foot. If the late Warren Evans and his teams of horses were still with us field trips to the mill sites might be in his wagons. Generations fondly remember the hayrides he happily provided. 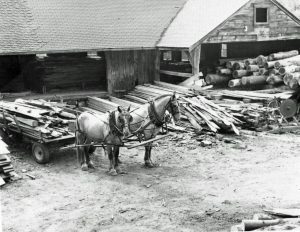 Warren hauled logs with horses to the Curtis sawmill on Boston Brook off Peabody Street up until vandals burned it in 1971. 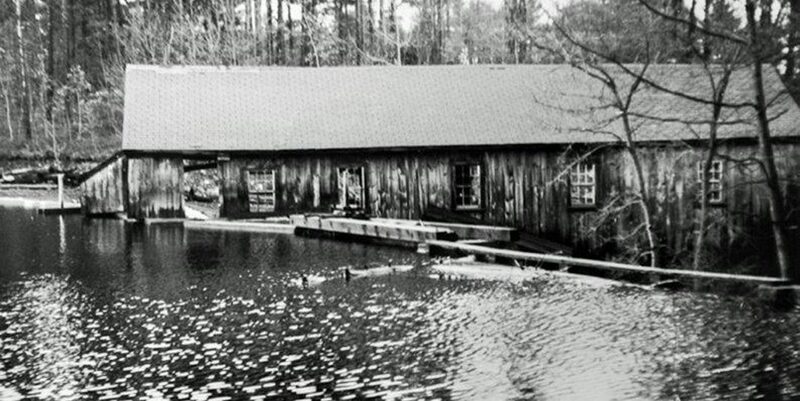 The Curtis sawmill (1930s to 1971) was the last water powered mill in the Ipswich River watershed. Cheap power didn’t always come unseen in wires. 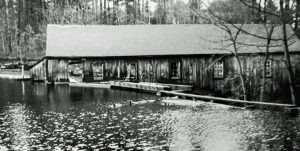 In the old days it came when the water in the mill ponds was high enough to run the water wheels fast and long enough. 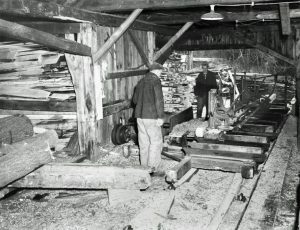 Many of the part-time millers were farmers with many other chores. In the 19th century the great mill dams and their canals with off shoots turned the thousands of wheels and shafts of the textile cities on the Merrimack River and its tributaries from Concord down to Amesbury. Many folks, increasingly provided with food and goods by train and ship, left the farms for wages in the mills. The wooden wheels of the small water mills rotted. Pastures and cultivated fields started going over to brush and woodlands. By the middle of the 20th century most Yankee farms were gone. Small Hamilton alone had over ninety farms before the Civil War. The once essential mills are now little-known ruins pointed out by a few old folks interested in local history. Before the English, the Indians had neither dams, mill ponds, wheels, nor bridges. They swam, forded streams or crossed on fallen logs or on stepping stones. The dams that then kept the water high in the watersheds were those of beavers. The English newcomers paid the Indians for the dam makers’ pelts. In a century or so the beavers were gone. The colonists who arrived here starting in the 1620s became the new dam builders. They were ambitious men who provided much needed boards, ship timbers, iron, clean wool, and flour. Alas, many of their dams affected an important source of protein for the few surviving Indians and themselves. Herring, shad, sturgeon, salmon and lamprey eels could no longer reach their fresh water spawning bottoms. The colonists required that notches in dams be open during spring spawning times but regulations weren’t always enforced and were in time forgotten. Environmentalists wanting fish so necessary to healthy rivers and coastal waters hope to take the fish-blocking manmade dams down. The Curtis dam was razed in 2013. The Bostik dam across the Ipswich River for almost 400 years is scheduled to be removed soon. 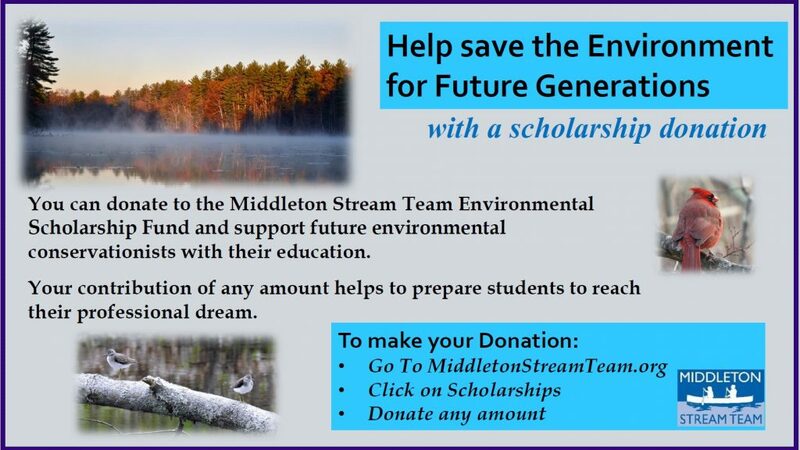 In Ipswich studies are being done concerning the fate of the large EBSCOT dam that once provided power for several industries. Better fish ladders and the removal of other dams are being contemplated elsewhere throughout New England especially in towns near the coast. The razing of the Edward’s Dam across the Kennebec River in Maine has allowed fish back. The Ipswich River and its tributaries, thanks to the Wetland Protection Act and the Conservation Commissions that administer it, the Ipswich River Watershed Association, stream teams, the beavers who keep the water higher, and the Essex County Greenbelt Association, are now better prepared for the fishes’ return. Imagine a time when solar panels and windmills provide our energy and coal power plants and the old manmade dams are just history. We’d like you to visit the latters’ remains before all are forgotten. If you want a map with further information of those in Middleton please contact the Middleton Stream Team. You are also urged to read Lura Woodside Watkins’ good chapter entitled the Water Mills of Middleton in her crackerjack book Middleton Massachusetts: A Cultural History. *Danvers Water Filtration Plant, Lake Street, Middleton is the source for actual precipitation data thru July. ** Middleton Stream Team is the source of actual precipitation data for August.